Oh how I love Fall with the crisp nights and sunny days, plus with the apple crop comes the abundance of apple cider. Here is a delicious drink which you can make as a large punch, or a single drink (but you’ll regret it and end up making more…) We made a pitcher by quadrupling the recipe and it was the best solution. Thanks to my friend Rebecca for improving the original recipe. This one is a keeper for sure. In a shaker or a tall glass add the Grand Marnier, tequila and apple cider and shake stir to mix. Add a few spoonfuls of cane sugar, coarse sugar and cinnamon to a plate. Run an orange segment around the edge of the glass, then press into the cinnamon sugar mixture to coat the rim. Add an orange slice to the bottom of the glass, fill with ice, then add the cider mixture. 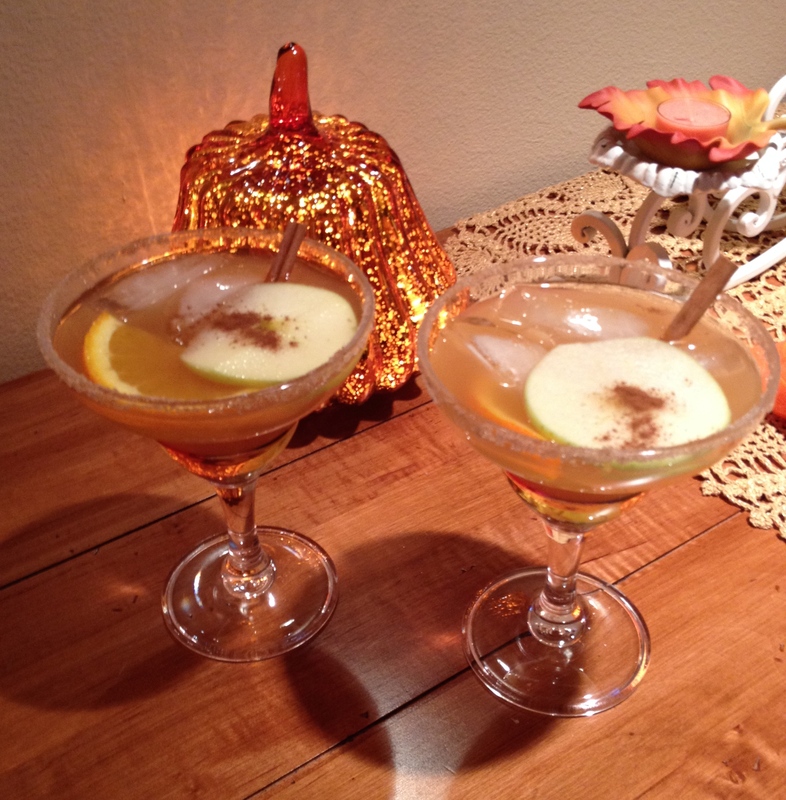 Garnish with an apple slice and cinnamon sticks, and sprinkle a bit of cinnamon on top of the apple slice. Enjoy! Posted in Beverages, Cinnamon, liquor, references, recipes and tagged apple cider, cinnamon, cinnamon sticks, margaritas. Bookmark the permalink. Oooh 2 of my favorite things…pumpkins and owls… I discovered this ale on friday and I’m hooked. 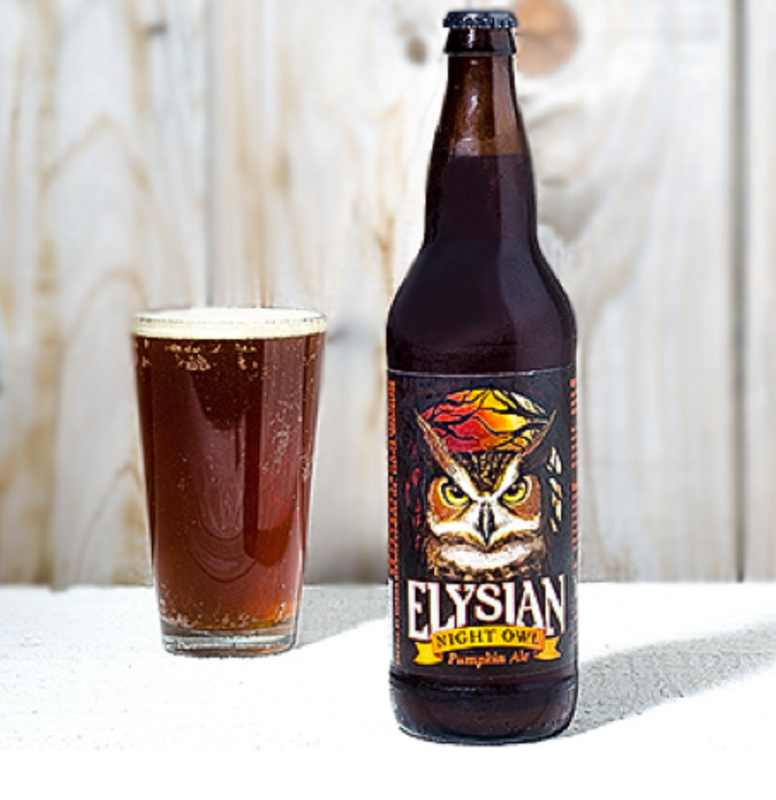 Crafted by Elysian Brewing Company, it is perfectly balanced with enough pumpkin and spices to taste like a fall beverage should without tasting like dessert. Both the men and women at our table liked this ale. The brewery’s site describes the process as being “brewed with seven and a half pounds of pumpkin per barrel and spiced in conditioning with ginger, cinnamon, nutmeg, cloves and allspice”. Check out the ale’s stats here. This is a seasonal ale and you should try a glass before it’s gone. Trust me, you’ll want to buy a 6 pack for your fridge. Posted in Beverages, Halloween, pumpkin and tagged Beer, pumpkin ale, pumpkin spice. Bookmark the permalink.